The bust and the monument dedicated to Vittorio Zanzi, “Patriot and Leader who extended Solidarity to the Persecuted”, installed in the homonymous park inaugurated in April 1987 (at the intersection of via Roma and via Cairoli), honour one of Cotignola’s most illustrious citizens, Vittorio Zanzi (1886-1985); a Republican steeped in Mazzini ideals and highly decorated for his participation in the Great War, Zanzi was the main organizer and leader of the solidarity network that made it possible to rescue Jews and refugees. By making the most of the opportunities inherent in his role as Prefecture Commissioner, Zanzi was able to provide persecuted families with false identity documents that were aptly printed on Municipal paper and prepared by the Civil Registry officials, and hide them in homes scattered across Cotignola. The Garden is located near the bank of the Senio river, along the provincial road that leads to Lugo, and houses a plaque inscribed with the names of Jewish refugees hidden in Cotignola, flanked by the names of those who offered them protection and hospitality. The stele, inaugurated in 1987, was installed in 2002 in the Giardino dei Giusti, whose center is populated by forty-one trees (one for each life saved) planted around a Lebanese cedar, symbol of Israel, and in front of which are laid six large stones representing the 6 million Jews killed in the Shoah. A new section of the Luigi Varoli Civic Museum was inaugurated in Palazzo Sforza in April 2012. It was dedicated to four Cotignola residents who were awarded the title of Righteous Among the Nations; the section houses archival material including films and photographs, two documentaries, by Fabrizio Varesco and Nevio Casadio, respectively, a multimedia installation by artist David Loom and L’Argine (The Embankment), some comic strips by Marina Girardi and Rocco Lombardi, in addition to other publications on the subject. In 2013, on piazzale Amendola, in the context of the broader street art project called Dal museo al Paesaggio (From Museum to Landscape), a wall painted by the Collective Fx. Located at the rectory of Budrio di Cotignola, it honours the work of Jewish physician Marco Oppenheim during the hospitality provided to his family in the village. The gravestones with the names of all fallen civilians and soldiers, placed in 1965 on the southern façade of Palazzo Sforza, relocated in 2003 inside the Church of Pio Suffragio, a shrine to the fallen inaugurated in November 1995 after years of work and restoration with the adjoining bell tower. A green area located in front of the bridge on the Senio river and inaugurated in 1977 with the Monument to the Resistance; here, we also find the monument dedicated to allied soldiers from New Zealand who cooperated with the British army and liberated Cotignola. The back of the monument features a memorial plaque of Operation “White Flag”, recalling the feat of priest Don Stefano Casadio and Communist Partisan Luigi “Leno” Casadio, in the morning of 10 April, 1945. Both gravestones were realized in 1995. These places, and, implicitly, the history of these individuals and the population, are part of an ideal memory map that pinpoints and links sites of Cotignola that recall the dramatic events related to the Second World War and the stalling of the Gothic Line along the Senio river, a war front that crushed the village of Cotignola between two armies for almost five months. 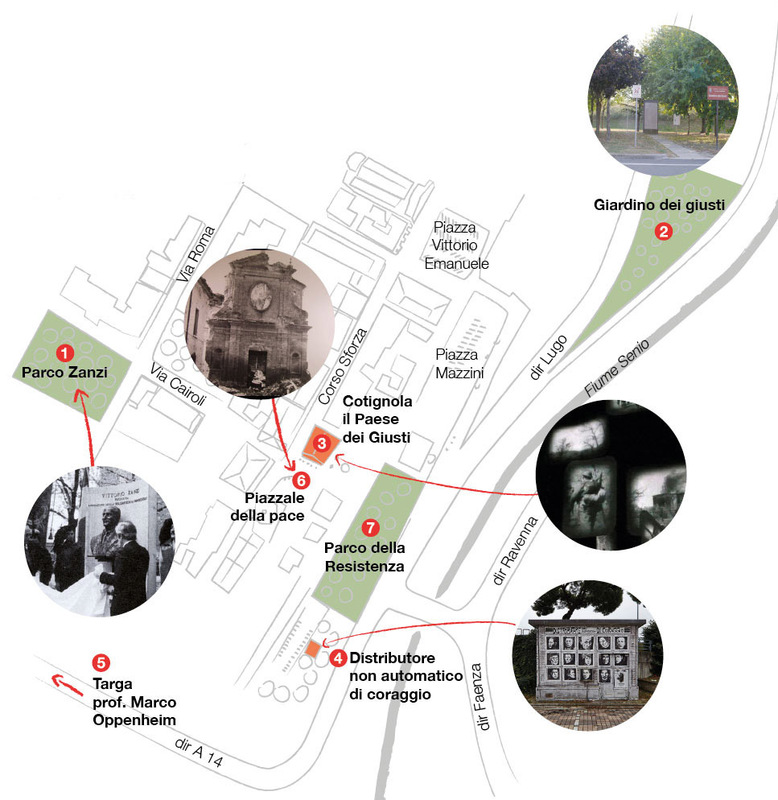 This map joins and interweaves a second path that testifies to the network of hospitality to and protection of Jews (and not only) by the four local Righteous residents, their assistants and the broad organizational network that involved a whole community.